This is not the first time we've looked at a Monitor Audio Radius system, but this is a different, more grown up and more ambitious combination. One key component of that system has been carried across intact to this 2007 incarnation: the R90 satellite, which gives the system its name, remains the core of this array. It fulfils the same role, namely as the front and rear speakers. It would be tempting to suggest that the R90 was perfectly formed in the first instance, so there was no compelling reason for change. Nothing's perfect, of course, but it would not have been easy to make significant advances without making some alterations to the form factor or driver complement. The same optional tall column stands remain available, and they were supplied for this test. Visually, they work well with the fronts for flat screens used on or near a wall. 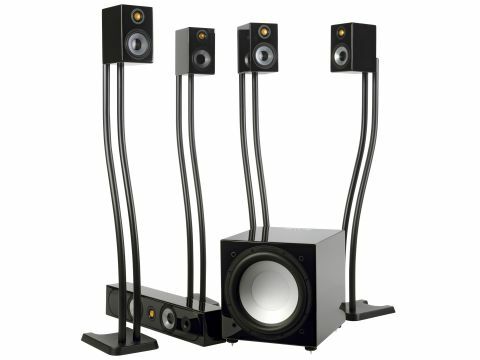 The stands feature elegant cable management in a form that allows the speaker cables to be connected at ground level, so that there is little danger of tripping over trailing wires. The R90 is also supplied with a ball-and-socket-based wall bracket. At 61cm long, the R225 centre speaker is long enough to take up much of the width of a medium size TV, and won't look out of place with much bigger screens. The design is comparable to the R90; these are beautifully-constructed speakers, with smoothly-radiused edges and corners, and with brilliant finishes - the black piano gloss is especially impressive. The subwoofer is a much bigger and better-engineered brute than the one specified for the last Radius system. Indeed, the RSW-12 is not strictly part of the Radius family, but a general purpose sub that can be used in a wide range of Monitor Audio and other systems. Depending on which piece of information you read, the internal amplifier is either 500W or 1000W. In fact, it appears to have a continuous 500W rating, the 1000W figure being a short-term peak rating. But, in any case there's plenty of power to drive the 12in drive unit. The enclosure is built like the proverbial brick outhouse, making it seriously heavy, but the finish is in keeping with the Radius speakers, so that the system looks the part. Unusually, the subwoofer is designed to be driven exclusively from the LFE or subwoofer output of the host system amplifier. It is not designed to be driven at loudspeaker level. The system is designed for comparatively compact spaces, though the new subwoofer gives it a degree of headroom that it didn't have in the past. As always, the primary aim is to provide 5.1 (or 7.1 channel if you buy an extra pair of R90s) sound in a form that is not too radical, but which is attractive and preferably doesn't alienate everyone else in the home. The tone is set by the R90 and the R225 centre speaker, which have a broad enough bandwidth to cope with most musical material without help from the subwoofer, though film soundtracks generally want some more grunt. In any case the system sounds clear, clean and agile. The midrange, in particular, offers well-focused stereo, with good depth and lateral positioning, and the treble lends finesse and fine detail to the mix. The centre speaker is not quite consistent sonically with the smaller R90. Perhaps the larger enclosure panel dimensions means that the some cabinet colourations have been bought down further into the audio band, and the result is a slightly more coloured sound, more obviously locked to the speaker itself. But the ability to play the centre channel louder, and evidently with less distortion, is welcome. The biggest change this time around concerns the subwoofer, which is a carefully optimised and very capable design. The internal low-pass filtering is of a high order, and its ability to play tunes with the lower frequencies intact is unusual. Most subwoofers tend to make speaker setups sound slower and less wieldy, and reduce the transparency of the system. But this is not the case here. The R90 system is palpably quick and agile, the bass is tuneful and well integrated into the system as a whole, and most of all it is larger in scale, it has greater authority than the previous Radius iteration. Careful setup of the subwoofer is key, though: with the PSW-12's unusual depth and weight it is all too easy to 'overcook' the system. Be sure to adjust the sub so that its influence on the system is to add bass that you sense rather than hear directly. The bottom line? A well integrated system that is palpably more grown up, with broader capabilities, not only than the previously tested Radius system, but than most subsat systems, which tend to be long on style, and short on overall capabilities. As far as it possible, this system is designed not to unduly compromise the audio fundamentals. Now how many times have you heard that said with any degree of conviction of any sub/sat system?